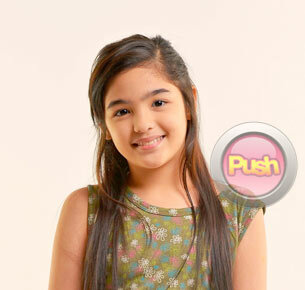 ABS-CBN's new child wonder Andrea Brillantes talks about top-billing 'Anna Liza' and being an avid fan of Kim Chiu. ABS-CBN Business Unit Head Ruel Bayani invited Push.com.ph to the on-location shoot of Anna Liza to meet the network’s new child star Andrea Brillante who’ll be reprising the role originally played by the late Julie Vega in the said TV remake. In between takes, the bubbly 10-year-old sat down for an interview and told Push that she had previous exposure in a few TV commercials and modeling stints before she was discovered in the afternoon soap Alyna. “Gina-guide naman po ako. Talagang hindi ko po alam kung paano umarte nun. Tapos ‘di pa ako marunong umiyak. Si Direk FM (Reyes) ang nagturo sa akin sa Alyna. Anak ako ni Shaina (Magdayao) dun,” said Andrea whose dad is of Spanish descent. Definitely not a newbie to teleseryes, Andrea has appeared as the young Andi Eigenmann in Kahit Puso’y Masugatan and young Kim Chiu in Ina Kapatid Anak. She also did acting stints in Eboy and Maalaala Mo Kaya and used to be a mainstay of Goin’ Bulilit for a year. Asked how she feels landing her first lead role in a teleserye, Andrea happily shared that it’s truly a privilege to be given this one-of-a-kind opportunity. As it is, she didn’t have to go through auditions and was handpicked by the management for the starring role. “Masaya at saka nae-excite ako kasi nung three years old pa lang ako gusto ko na maging bida. Sobrang saya ko kasi parang nagkaroon sila ng trust sa akin na bigyan ako ng show. Tsaka siyempre 1980 to 1986 si Julie Vega pa yung gumanap. Isa rin yun sa idol ko,” said Andrea who said she researched about her character via internet.